Tapas is the collective name for small, delicious mouthfuls of something savoury, served with a chilled white wine, beer or sherry. It comes from tapa, the Spanish word for lid - specifically, the lid created by th slice of bread that an innkeeper would place on top of a customer's wine glass to keep out the flies and dust between sips. Then the Andalucians decided to blanace a morsel fo something tasty on top of the bread to nibble on. I'm hosting this month's Sweet Heat Challenge for Lyndsay at Vanilla Clouds and Lemon Drops and I have chosen Tapas as the theme. That means that the Tapas for the challenge has to include chilli in some form or other. I decided to make my tapas into a meal, I added the sweetcorn after realising how meat based I had made my choice of dishes! 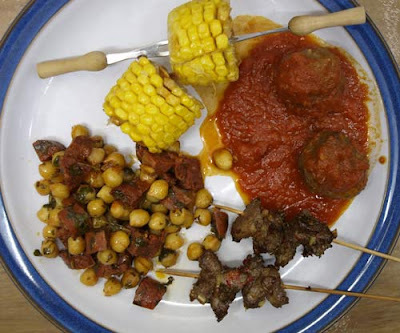 So, working from the front left in a clockwise direction: Chickpeas with Chorizo, Sweetcorn Bites roasted in butter, meatballs in Pepper and Tomato Salsa, Lamb Skewers with lemon and chilli. My entry for Sweet Heat is Pepper and Tomato Salsa which was totally delicious and really lifted the basic ready made meatballs that I bought in the supermarket. Heat the olive oil in a flameproof casserole dish. Add the garlic and peppers and cook for 10 minutes over a medium heat, stirring occasionally until the peppers are just soft. Add the tomatoes, orange rind and chilli pepper flakes, season to taste. Simmer the sauce for about 45 minutes until the sauce thickens. Use a stick blender or liquidiser to puree the sauce. I used ready made meatballs, I put them in an oven proof dish and cooked them in a hot oven (200C) for about 30 minutes until they were browned. Add to the sauce after it has been pureed, leave to absorb some of the flavour for an hour of so and reheat gently. Serve the Meatballs warm, not hot. Would be good with couscous, rice, mash or chunks of crusty bread. 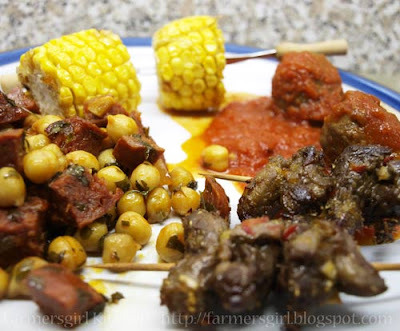 I'll post the recipes for the lamb and the chickpeas with chorizo another day. What delicious tapas, we had a tapas lunch on Saturday! But I didn't photograph it! Really like tapas, it's being able to try a bit of this and a bit of that without envying what everyone else has got that particularly appeals. Just as well I didn't blog the tomato chili jam I made to go with the Patatas Bravas! that's gorgeous! I love the idea of tapas, being able to share and taste a little of everything with friends. it's kind of similar to the concept of dim sum, but a little more varied and less fiddly! I love tapas and had some great meatballs at the end of last year in Spain. I love being able to eat lots of different things at one meal. Gosh, i could did straight into that dish right now. I love the variety of tapas!